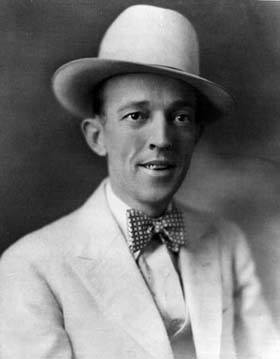 His brass plaque in the Country Music Hall of Fame reads, "Jimmie Rodgers' name stands foremost in the country music field as the man who started it all." This is a fair assessment. The "Singing Brakeman" and the "Mississippi Blue Yodeler," whose six-year career was cut short by tuberculosis, became the first nationally known star of country music and the direct influence of many later performers, from Hank Snow, Ernest Tubb, and Hank Williams to Lefty Frizzell and Merle Haggard. Rodgers sang about rounders and gamblers, bounders and ramblers -- and he knew what he sang about. At age 14 he went to work as a railroad brakeman, and on the rails he stayed until a pulmonary hemorrhage sidetracked him to the medicine show circuit in 1925. The years with the trains harmed his health but helped his music. In an era when Rodgers' contemporaries were singing only mountain and mountain/folk music, he fused hillbilly country, gospel, jazz, blues, pop, cowboy, and folk; and many of his best songs were his compositions, including "TB Blues," "Waiting for a Train," "Travelin' Blues," "Train Whistle Blues," and his 13 blue yodels. Although Rodgers wasn't the first to yodel on records, his style was distinct from all the others. His yodel wasn't merely sugar-coating on the song, it was as important as the lyric, mournful and plaintive or happy and carefree, depending on a song's emotional content. His instrumental accompaniment consisted sometimes of his guitar only, while at other times a full jazz band (horns and all) backed him up. Country fans could have asked for no better hero/star -- someone who thought what they thought, felt what they felt, and sang about the common person honestly and beautifully. In his last recording session, Rodgers was so racked and ravaged by tuberculosis that a cot had to be set up in the studio, so he could rest before attempting that one song more. No wonder Rodgers is to this day loved by country music fans. The youngest son of a railroad man, Rodgers was born and raised in Meridian, MS. Following his mother's death in 1904, he and his older brother went to live with their mother's sister, where he first became interested in music. Rodgers' aunt was a former teacher who held degrees in music and English, and she exposed him to a number of different styles of music, including vaudeville, pop, and dancehall. Though he was attracted to music, he was a mischievous boy and often got into trouble. When he returned to his father's care in 1911, Rodgers ran wild, hanging out in pool halls and dives, yet he never got into any serious trouble. When he was 12, he experienced his first taste of fame when he sang "Steamboat Bill" at a local talent contest. Rodgers won the concert and, inspired by his success, decided to head out on the road in his own traveling tent show. His father immediately tracked him down and brought him back home, yet he ran away again, this time joining a medicine show. The romance of performing with the show wore off by the time his father hunted him down. Given the choice of school or the railroad, Rodgers chose to join his father on the tracks. For the next ten years, Rodgers worked on the railroad, performing a variety of jobs along the South and West Coasts. In May of 1917, he married Sandra Kelly after knowing her for only a handful of weeks; by the fall, they had separated, even though she was pregnant (their daughter died in 1938). Two years later they officially divorced, and around the same time, he met Carrie Williamson, a preacher's daughter. Rodgers married Carrie in April of 1920 while she was still in high school. Shortly after their marriage, Rodgers was laid off by the New Orleans & Northeastern Railroad, and he began performing various blue-collar jobs, looking for opportunities to sing. Over the next three years, the couple was plagued with problems, ranging from financial to health -- the second of their two daughters died of diphtheria six months after her birth in 1923. By that time, Rodgers had begun to regularly play in traveling shows, and he was on the road at the time of her death. 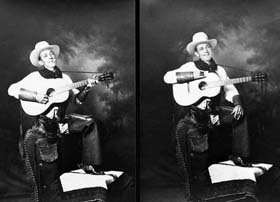 Though these years were difficult, they were important in the development of Rodgers' musical style as he began to develop his distinctive blue yodel and worked on his guitar skills. In 1924, Rodgers was diagnosed with tuberculosis, but instead of heeding the doctor's warning about the seriousness of the disease, he discharged himself from the hospital to form a trio with fiddler Slim Rozell and his sister-in-law Elsie McWilliams. Rodgers continued to work on the railroad and perform blackface comedy with medicine shows while he sang. Two years after being diagnosed with TB, he moved his family out to Tucson, AZ, believing the change in location would improve his health. In Tucson, he continued to sing at local clubs and events. The railroad believed these extracurricular activities interfered with his work and fired him. Moving back to Meridian, Rodgers and Carrie lived with her parents before he moved away to Asheville, NC, in 1927. Rodgers was going to work on the railroad, but his health was so poor he couldn't handle the labor; he would never work the rails again. Instead, he began working as a janitor and a cab driver, singing on a local radio station and events as well. Soon, he moved to Johnson City, TN, where he began singing with the string band the Tenneva Ramblers. Prior to Rodgers, the group had existed as a trio, but he persuaded the members to become his backing band because he had a regular show in Asheville. The Ramblers relented, and the group's name took second billing to Rodgers, and the group began playing various concerts in addition to the radio show. Eventually, Rodgers heard that Ralph Peer, an RCA talent scout, was recording hillbilly and string bands in Bristol, TN. Rodgers convinced the band to travel to Bristol, but on the eve of the audition, they had a huge argument about the proper way they should be billed, resulting in the Tenneva Ramblers breaking away from Rodgers. He went to the audition as a solo artist, and Peer recorded two songs -- the old standards "The Soldier's Sweetheart" and "Sleep, Baby, Sleep" -- after rejecting Rodgers' signature song, "T for Texas." Released in October of 1927, the record was not a hit, but Victor did agree to record Rodgers again, this time as a solo artist. In November of 1927, he cut four songs, including "T for Texas." Retitled "Blue Yodel" upon its release, the song became a huge hit and one of only a handful of early country records to sell a million copies. 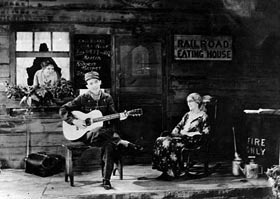 Shortly after its release, Rodgers and Carrie moved to Washington, where he began appearing on a weekly local radio show billed as the Singing Brakeman. Though "Blue Yodel" was a success, its sales grew steadily throughout early 1928, which meant that the couple wasn't able to reap the financial benefits until the end of the year. By that time, Rodgers had recorded several more singles, including the hits "Way Out on the Mountain," "Blue Yodel No. 4," "Waiting for a Train," and "In the Jailhouse Now." On various sessions, Peer experimented with Rodgers' backing band, occasionally recording him with two other string instrumentalists and recording his solo as well. Over the next two years, Peer and Rodgers tried out a number of different backing bands, including a jazz group featuring Louis Armstrong, orchestras, and a Hawaiian combo. 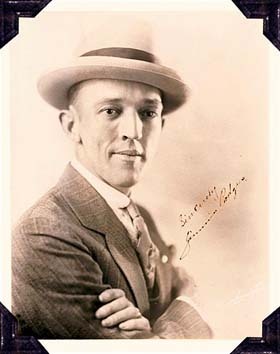 By 1929, Rodgers had become an official star, as his concerts became major attractions and his records consistently sold well. During 1929, he made a small film called The Singing Brakeman, recorded many songs, and toured throughout the country. Though his activity kept his star shining and the money rolling in, his health began to decline under all the stress. 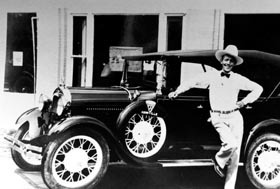 Nevertheless, he continued to plow forward, recording numerous songs and building a large home in Kerrville, TX, as well as working with Will Rogers on several fundraising tours for the Red Cross that were designed to help those suffering from the Depression. By the middle of 1931, the Depression was beginning to affect Rodgers as well, as his concert bookings decreased dramatically and his records stopped selling. Despite the financial hardships, Rodgers continued to record. Not only did the Great Depression cut into Rodgers' career, but so did his poor health. He had to decrease the number of concerts he performed in both 1931 and 1932, and by 1933, his health affected his recording and forced him to cancel plans for several films. Despite his condition, he refused to stop performing, telling his wife that "I want to die with my shoes on." By early 1933, the family was running short on money, and he had to perform anywhere he could -- including vaudeville shows and nickelodeons -- to make ends meet. For a while he performed on a radio show in San Antonio, but in February he collapsed and was sent to the hospital. Realizing that he was close to death, he convinced Peer to schedule a recording session in May. Rodgers used that session to provide needed financial support for his family. At that session, Rodgers was accompanied by a nurse and rested on a cot in between songs. Two days after the sessions were completed, he died of a lung hemorrhage on May 26, 1933. Following his death, his body was taken to Meridian by train, riding in a converted baggage car. Hundreds of country fans awaited the body's arrival in Meridian, and the train blew its whistle consistently throughout its journey. For several days after the body arrived in Rodgers' hometown, it lay in state as hundreds, if not thousands, of people paid tribute to the departed musician.